There are a plethora of filtration systems for saltwater aquarium out there and choosing one can seem like a difficult choice. However, you can narrow down your choices by considering the size of your fish tank. Suitable For: 55 to 100 gallon fish tanks. The Penn Plax Cascade filter is one of the best saltwater aquarium filtration systems because of the commendable features it has. This filter delivers on your needs by lasting for a long time and keeping the fish tank clean like no other. It can filter up to 300 gallons per hour and makes the water appear crystal clear. 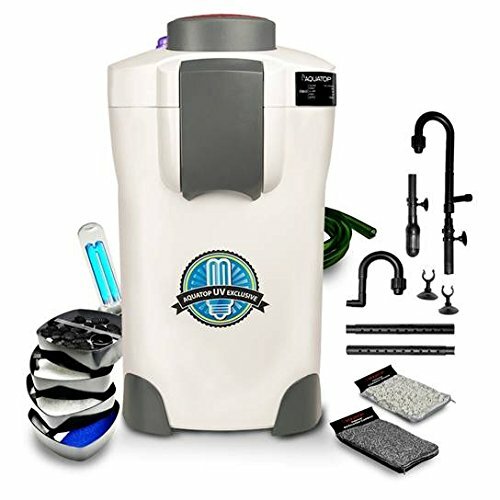 Equipped with carbon cartridges that filter out impurities, all sorts of odors and discoloration toxins from the fish tank, this filter removes the needs to do anything manually. Once the cartridge is finished, it is also very easy to replace. To keep the environment clean and healthy, the internal sponge improves the colonization of the beneficial bacteria and helps to eliminate the presence of ammonia and nitrite. The external Biofall Biological booster promotes oxygen exchange for better and healthier aeration throughout the aquarium. This hang-on device fits perfectly on your tank while its intake tube is passed into the tank to clean up efficiently. However, being noisy is one flaw that can irritate some people. Suitable for both saltwater and freshwater. The filter motor doesn’t require maintenance. Comes with filtration knobs to adjust the level of filtration while feeding the fishes. 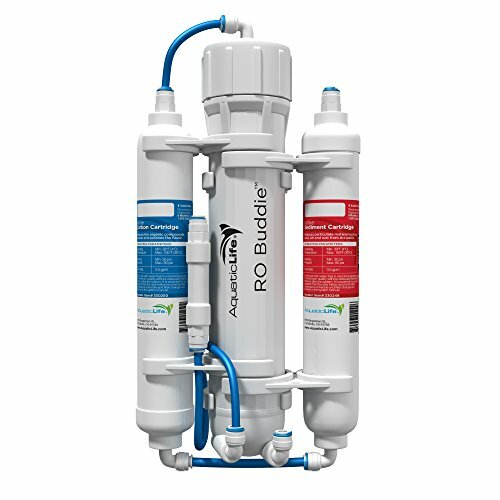 The Aquatic Life RO Buddie Reverse Osmosis System comes with various components such as sediment filter, RO membrane, active carbon filter and mixed bed DI-cartridge that make filtration easy and effective. This is one of the best saltwater aquarium filtration systems because it works in 3 stages and performs reverse osmosis and deionization. The first stage involves filtering out large particles (sand, dust, rust, rocks) that come from tap water. The second stage involves the RO membrane purifying the water from chlorine and other harmful substances. It allows only water to pass through and blocks everything else. The third stage is concerned with removing organic and inorganic compounds and completely purifying the water. The carbon cartridges work like a charm and are very easy to replace. The system comes with mounting brackets so that you can place it close to your aquarium. The only flaw of this product is that it is difficult to install and might take some hours to do so. Quality purification of salt water. Leakage issues if system is not fit properly. Suitable For: 110 gallons fish tank. 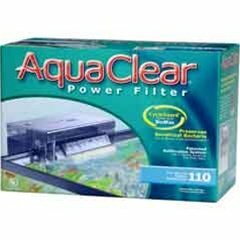 Aquaclear filters are considered to be among the best saltwater aquarium filter systems, and this device from the maker is among their best. This filter system works silently and performs excellent filtration. These are also very durable as compared to other filter systems and are said to run for years without any issues. Purifying 500 gallons per hour is something not every filter system can do but the AquaClear Power Filter is made to do it without any trouble. It keeps your saltwater fish tanks clear with its trio combo, biological, mechanical and chemical capabilities. - The mechanical filtering is concerned with removing the fish waste and uneaten food particles with the help of foam blocks because these waste particles can generate a foul smell and also contaminate the tank by releasing toxins. - The biological filtering promotes the growth of beneficial bacteria which aids in breaking down fish waste into non-toxic nitrate. These 3 functionalities is what makes this filter system so effective. While it seems to be a perfect option, on the downside it comes with a U-shaped tube that can snap after a few months of usage. Foam/Sponge requires replacement once a week when it gets dirty. Suitable For: 75 gallons fish tank. Getting a canister filter like the Flexzion HW-302 makes your fish tank look equipment free and elegant. It comes with 3 media filtration trays that allow you to carry out your choice of filtration and keep your fish aquarium clean and maintained. The Flexzion HW-302 eliminates the need to manually siphon as it has a self priming pump. Also, there’s an adjustable spray bar that lets you control flow as you see fit. While there are other canister filters on the market, this is one of the best due to its affordable cost, and great functionalities. Moreover, this filter system doesn’t irritate or distract you because it works silently, yet effectively. However, some customers have reported leak issues, but they are minimal. ​Adjustable output flow of filter. Might face minimal leak issues in the future. Suitable For: 125 gallons fish tank. Aquatop canister filters are growing in popularity and customers are becoming more and more influenced with their performance and low maintenance. The reason for their rapid spread is because of their trio filtration mechanism (chemical, biological and mechanical) and the fact that they can be used for a number of fish tanks, namely, saltwater tanks, reef tanks and even turtle tanks, because of their versatile compatibility, they are winning the hearts of fish lovers all around the globe. This beauty from Aquatop offers impressive flow rate. It provides filtration up to 370 - 525 GPH, depending on the model. This means the job is completed in a quicker fashion. The filter system comes equipped with a self prime pump that saves you the hassle of siphoning manually. 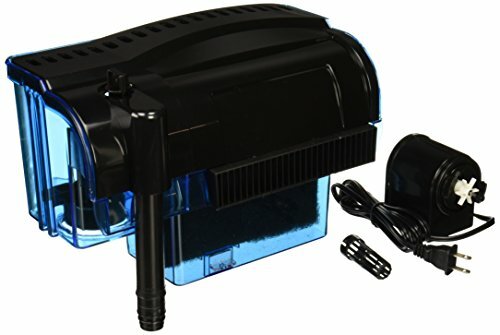 With this filter, you do not have to worry about algae and bacteria either as the filter comes with a 9 watt UV sterilizer light that kills all types of harmful objects found in the aquarium. The filter comes with 3 large media filtration parts allowing you to set it according to your own taste. The blue sponge makes sure that mechanical filtration is carried out smoothly and the 3 filter pads cleans the impurities. While this device looks perfect on paper, there is a small flaw as well. Many users have reported that air often gets trapped in the canister and needs to be removed before operating it. Other than that it is one of the best saltwater aquarium filter systems of all time. ​Comes with a UV sterilizer to eliminate the bacteria and Algae. Sometimes, air gets trapped in the suction area and needs to be removed. Choosing a filter system for your fish tank is important if you want the fish to remain healthy. Other than this, a filter is also important for the overall look. There are tonnes of options out there, which may cause you to get lost. We recommend that you consider our suggestions and pick one from our five spectacular saltwater aquarium filtration systems.